The benefits of resveratrol are becoming better known. Here is an article about the amazing benefits of resveratol. Resveratrol is a naturally occurring substance found in several plant sources, including grapes. It has shown promise as a life-enhancing - and extending - supplement. The French are noted for their relatively healthy hearts despite a diet which is quite high in fats. One reason for this "French paradox" - which fascinated nutritionists for years - is the consumption of resveratrol. Resveratrol is a naturally occurring chemical found in some plants. it is thought to have evolved as a protection against fungal attack. It is found in relatively high quantities in the skins of red grapes. We all know about the French and their love affair with the grape! Harvard researchers looked into this phenomenon and subjected mice to tests. They found that mice given resveratrol lived significantly longer than mice in the control group. Problems other than simple life-span optimisation have been shown to be affected by taking resveratrol. It has become clear that many of the diseases of civilisation may be helped by judicious use of this wonder compound. Research is on-going but some studies have already indicated that resveratrol will promote apoptosis, or self destruction, within cancer cells. This may turn out to be useful in cancers where the resveratrol can be in direct contact with the tumour, digestive tract tumours in particular. There has also been some evidence that Alzheimer's may be helped by taking resveratrol supplementation. Alzheimer's is a condition usually associated with aging. Resveratrol has been found to appear to promote beta-amyloid degradation - that is, it tends to destroy the substance responsible for the build-up of plaque in the brains of affected people. Research is on-going into these potential benefits of resveratrol. Again research with mice has yielded some interesting results for the treatment of Alzheimer's. The degenerative changes in the brain may be slowed or even stopped by treatment with reservatrol. In mice, the memory was enhanced and plaque deposits were reduced. Diabetes has also been helped by resveratrol. Excessive hunger and increased thirst are both symptoms of diabetes which have been helped by it. Type 2 Diabetes is currently at epidemic proportions in some parts of the world owing to the high-fat high sugar diets which are promoted by many of the food industry giants. The USA has around 26 million diabetics. The benefits of resveratrol may have a part to play in combatting this life-sapping disease - along with diet reform and healthy exercise programmes. An active ingredient in resveratrol is a polyphenol and antioxidant but there is another component, trans-resveratrol. Trans-resveratrol is believed to trigger the SIRT1 “Longevity Gene.” This gene has been studied with some interest because of its role in prolonging life. Calorie restricted diets are also thought to activate the so-called longevity gene. There are dedicated groups who try prolong their own lives by severely restricting their calorie consumption. Of course, such diets are not of interest to most of us, for whom food is one of life's great pleasures! Any substance which prolongs life and also leads to better health is bound to be of interest to scientists and researchers. There is so much ill-health and disease which is caused at least in part by inadequate diet. Improving our diets and access to fresh, healthy food is a one big objective for many green activists. In my view it is an important aspect of green living. Organically grown foods are generally healthier than conventionally grown foods. This is because a more complex and wealthy spread of vitamins, minerals and other essential nutrients is found in well-tended soils and the plants that grow on them. Also, conventional farmingpractice involves the wide scale use of toxic chemicals. Some of these inevitably end up on our dinner plates. Not all of these chemicals are effectively processed by our livers. Some of them may stay in our body tissues and over the long term harm our health. The European study completed in 2007 (by Professor Carlo Leifert), found that organically produced fruit and vegetables contained as much as 40% more antioxidants. They were also far better in their levels of zinc and other essential minerals. The same study noticed the persistence of pesticide residues in many of the conventional farming products. 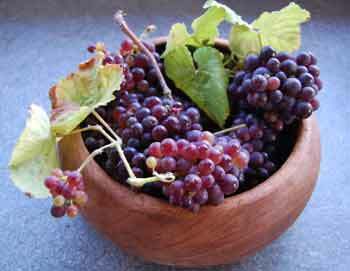 Most types of Resveratrol will be produced with non-organic grapes. "Reservage" is the only one that I know of that does things in a 100% organic manner. It's worth emphasising that a well-rounded and healthy lifestyle is often enhanced by scientific knowledge and the judicious use of well-chosen supplements. Any supplement which makes it easier for people to achieve health and vitality could be a valuable part of green living, in my view. Yes it would be great if we could all just eat natural, organic foods and keep healthy. In practice the stresses and strains of modern life make that a difficult goal for most people to achieve without help from occasional supplementation. 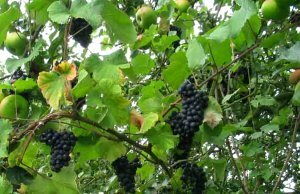 I haven't yet tried the benefits of resveratrol for myself - except in the form of home-grown black grapes. I do use a number of supplements - in particular fish oil and enzymes and I definitely appreciate the benefits they give me. I'll report back as soon as I get around to trying resveratrol myself and would be interested if anyone else reading this site has tried it. If you would like to add a short piece about your experience of the benefits of resveratrol please see green tips. See below for books on resveratrol benefits and other topics to do with food and health. You can get all the benefits of reservatrol from organic supplements. Read more about resveratrol and longevity in The Longevity Factor: How Resveratrol and Red Wine Activate Genes for a Longer and Healthier Life. This well-regarded book takes a practical approach to enhancing longevity and making better health and a long life within the grasp of most people. For more information on the elements of a healthy diet which fits with green living principles, please see Healthier diet advice for fitness and energy.